Behind this point, having also seen the Audience Chamber, we reached the fourth courtyard. This was my favorite spot in the palace. 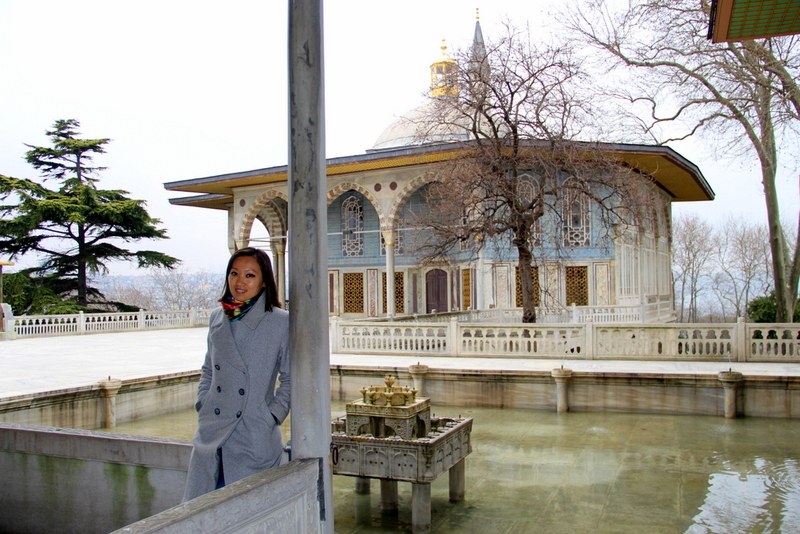 The marble terrace offers wide views of the Marmara Sea, and contains a fountain and several small, beautiful pavilions. 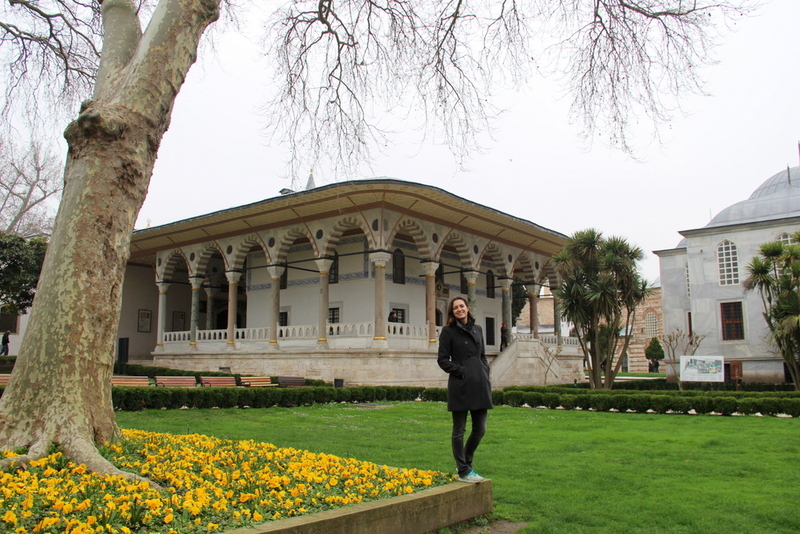 These were designed mainly for the sultan to rest, and their interiors are adorned with Iznik tiles, stained-glass windows, mother-of-pearl and tortoise shell. 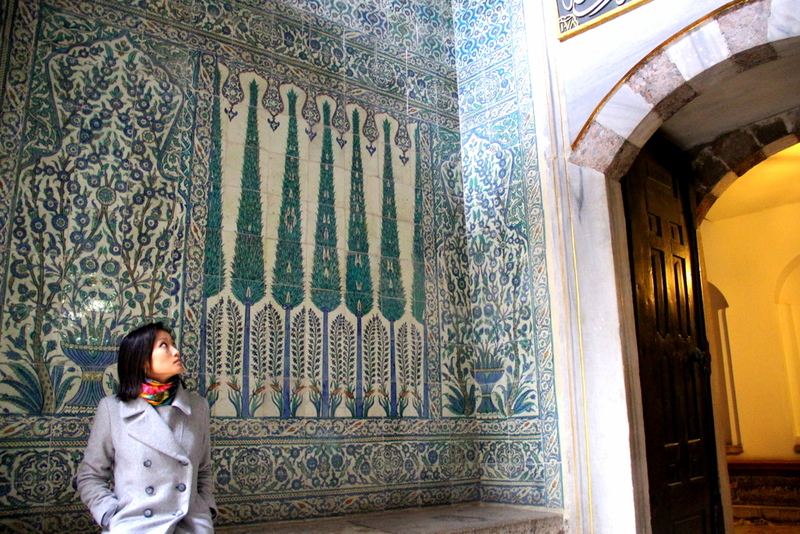 Walking back by some other rooms that contained important Muslim relics (like Muhammed’s cloak), we reached the harem. This cluster of buildings was occupied by the royal family, the sultan’s numerous concubines, and their service. Roaming around the luxurious chambers and the maze-like passages completely alone, we tried to imagine how life would have been back then. We exited the Topkapi enclosure after about two hours, without even having seen everything, and treated ourselves to some roasted chestnuts. While snacking, we walked north-west on nice pebbled, commercial streets. 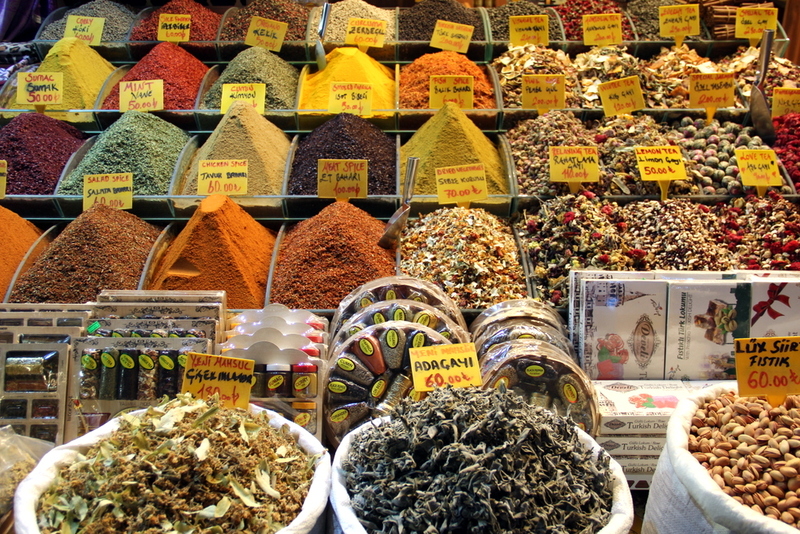 We soon reached the Spice Bazaar, a miniature version of the Grand Bazaar that we actually enjoyed much more. Although the shops sell the same repetitive teas, sweets and souvenirs, it is much smaller/manageable and feels more authentic. 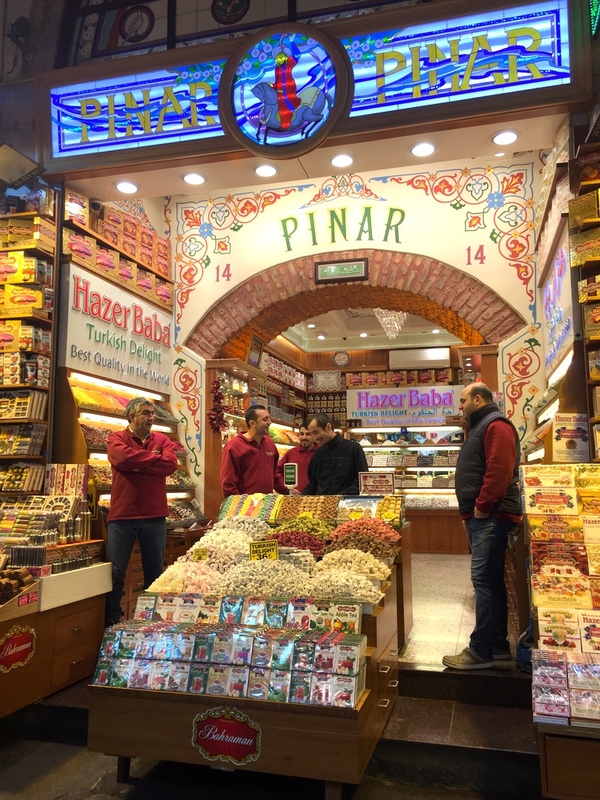 I particularly liked the shops on the external side of the bazaar, we found good deals there. The samples that we were getting as we were walking around were not enough for our growling stomachs, so found a restaurant for a quick lunch. Hamdi Restaurant, right by the bazaar, had decent kebab and cacik dip (the Turkish equivalent of Greek tzatziki). 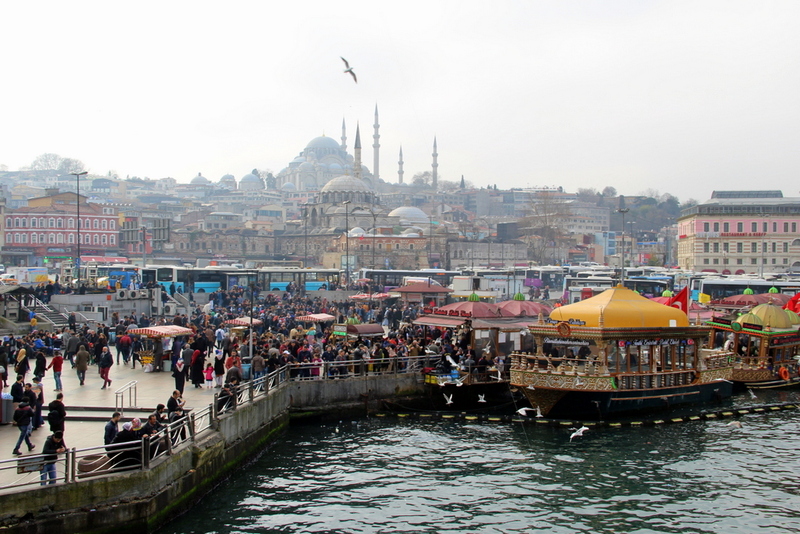 More importantly, it had awesome views of the New Mosque and the Galata Bridge, our next two stops. 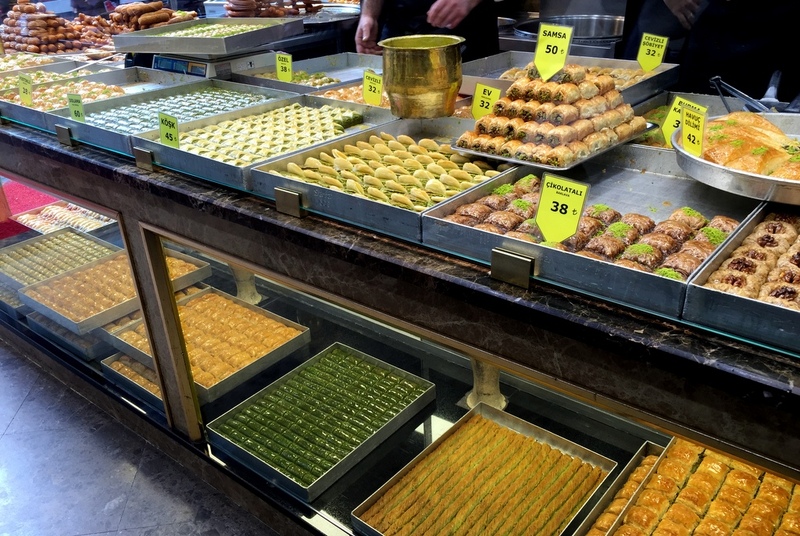 But before we continued exploring the city, we wanted to satisfy our baklava cravings. We found a little specialized bakery on another side street and indulged J Right across it, there was also great coffee place, where locals were lining up to buy extremely cheap and extremely aromatic coffee, which made for a great gift to bring back. We moved on to Yeni Cami, which, despite being called the New Mosque, is over 300 years old. 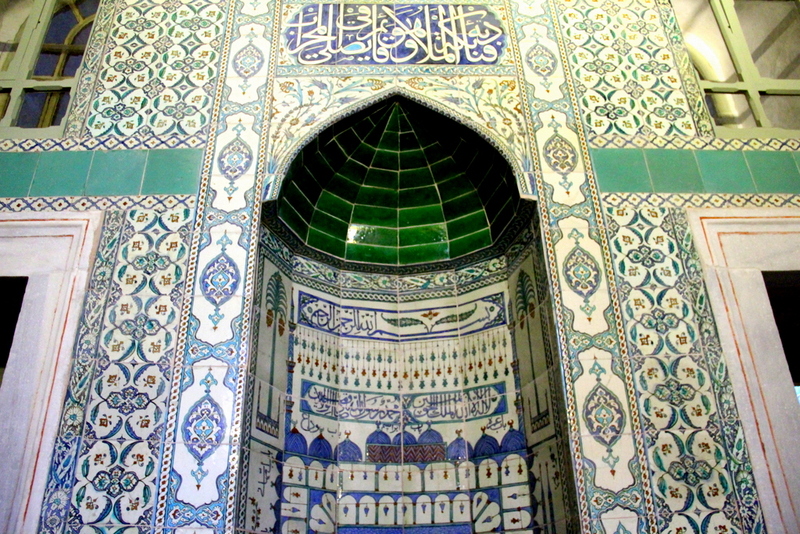 It was yet another impressive temples, with its interior covered in blue tiles. 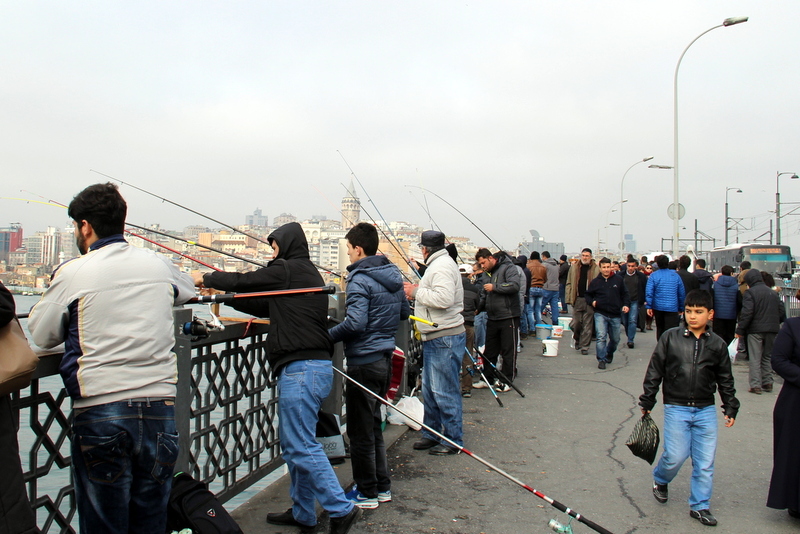 We crossed the street using an underground pass, and found ourselves surrounded by hordes of locals, which congregate on the south side of the Galata Bridge to eat the famous fish sandwiches from the boats. The walk on the bridge was nice, offering fantastic views of the Suleymaniye and the Yeni Mosques to the south, and the Galata Tower to the north. There were lots of fishermen trying the luck on the upper level, while the lower level has been devoted to touristy restaurants. 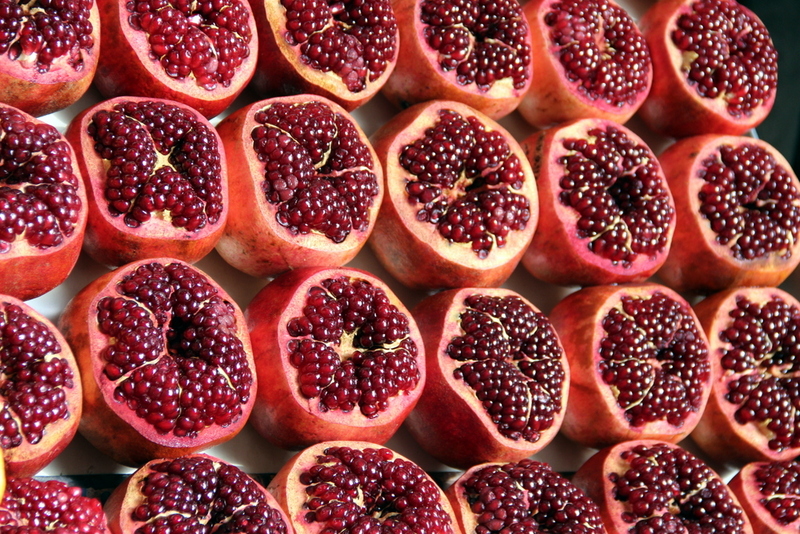 We reached the other side, Karakoy, which is becoming the trendiest neighborhood of Istanbul. 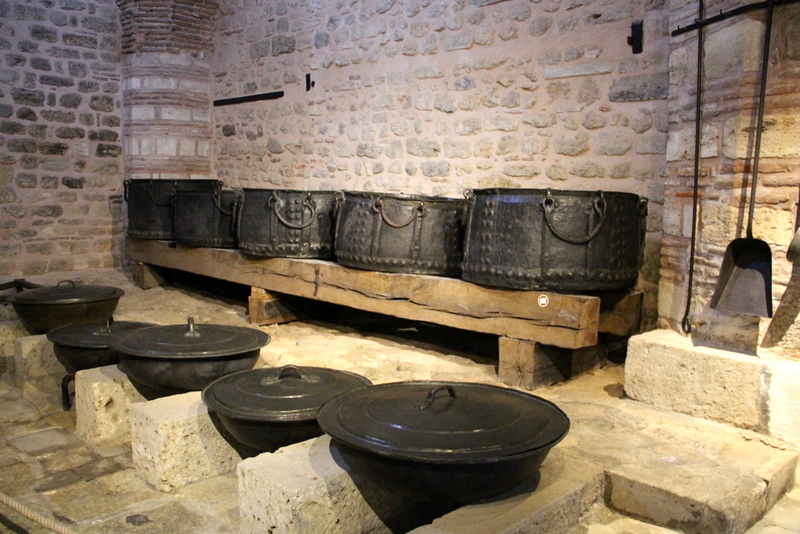 We wandered around, enjoying the mix of traditional workshops and chic cafes. 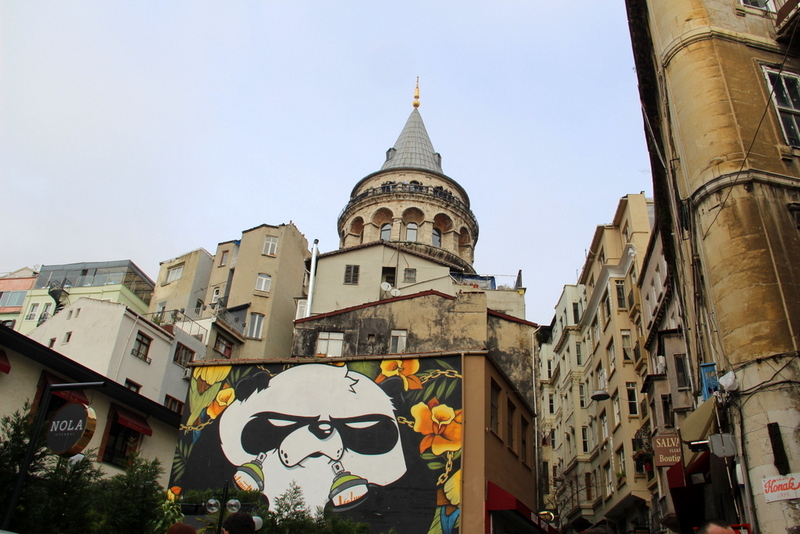 At the end of a steep street, the Galata Tower emerged. One of the city’s landmarks, this stone tower was the tallest building when it was built back in the 14th century. There is an observation deck at the top (TL 12, ~$4), but we skipped it because the visibility wasn’t good that day. Nevertheless, I really liked getting close to the medieval structure. 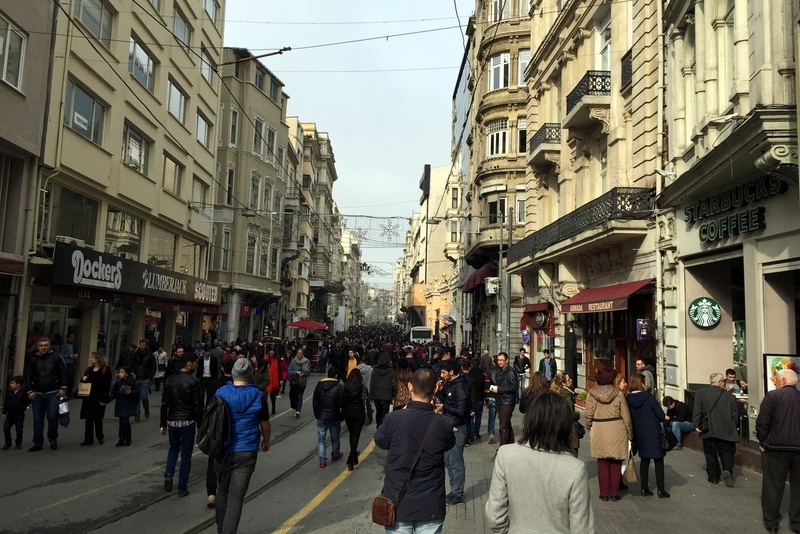 From there, we took Istiklal Avenue all the way up to Taksim Square. 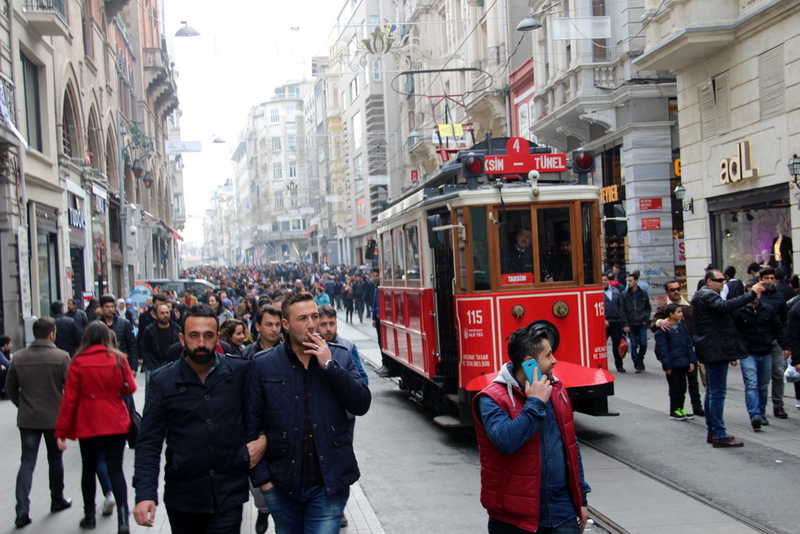 This is Istanbul’s main artery, and it shows. There were hundreds of people walking around, shopping and eating, in endless stores; from modern clothing brand shops to handmade sweet stands. We enjoyed a long walk, getting lost in some side streets. 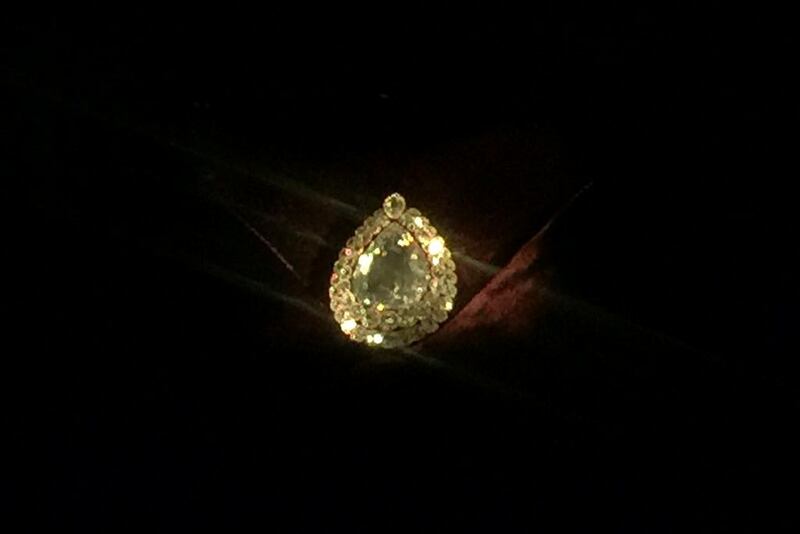 Suddenly, we heard a ring sound and soon saw the traditional tram coming up… such a picturesque sight! 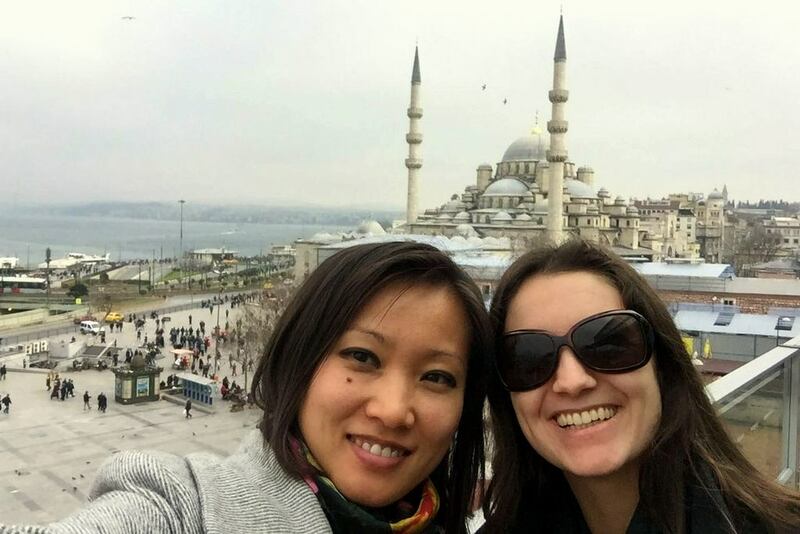 When we reached Taksim, we were unimpressed, and the Marmara Hotel rooftop, which has the best views in the area, was closed. So we decided to head back to Sultanahmet. 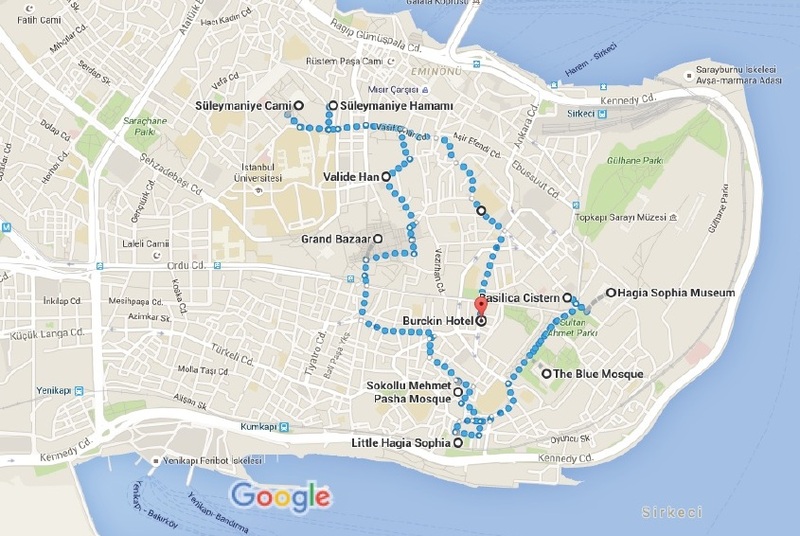 One of the best things about Istanbul is the amount of good budget hotels located in the historic neighborhood. 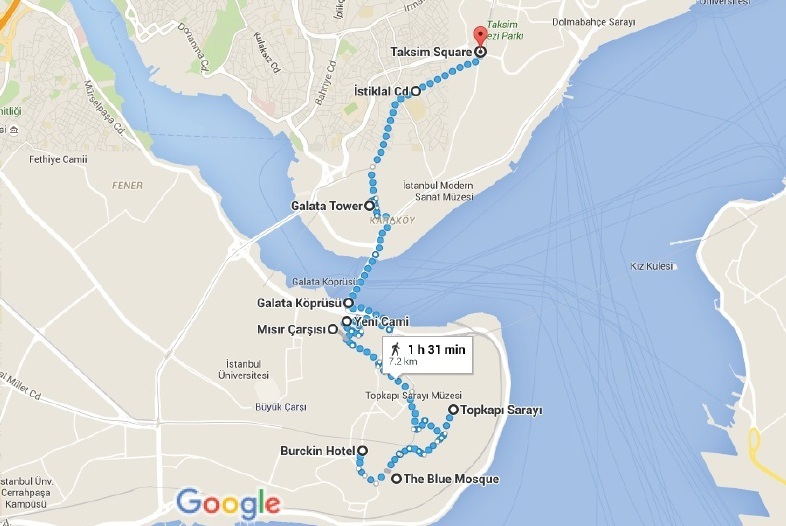 It’s perfect to visit the most famous sites during the day and enjoy the restaurants on Divan Yolu in the evening, all on foot. This street, 1 minute away from where we were staying (Burckin Hotel), was always lively, and we were able to grab a durum kebab and grenadine juice, and browse through souvenir shops until late at night. PS: It was an epic, if exhausting weekend in Istanbul, and we got to cover nearly all the must-have sights and experiences. If we had a bit more time, or the winter days weren’t as short, we could have added a few more things to our itinerary. From my previous visit, I have very fond memories of the Chora Church, also known as Kariye Museum, which hosts gorgeous mosaics and frescoes. Despite being out of the way, it’s worth a visit if you can work it into your schedule. Back then, with three summer days to explore, we also took a boat to cruise the Bosphorus and the visited the European-style Dolmabahce Palace.